I’ve been meaning to getting around to starting a personal blog for ages now. I’ve been writing for PVR Wire, TV Squad, and Download Squad for the last half year, but this is my first foray into the personal web. A little about myself. I’m just a few weeks shy of turning 30, and for the last 7 years or so I’ve made my living by writing in one way or another, although I only recently figured that out. When I was a child I was an avid reader, and dreamed of making a living as a novelist. By the time I was 13, it occurred to me that not very many people get to support themselves by writing fiction, so I joined the junior high newspaper. I wrote exactly one story and decided that journalism wasn’t for me, so I let my interests wander and got a liberal arts education. I was always interested in radio, and got a degree in communication while I managed the student radio station at DePaul University in Chicago. I use the words radio station loosely. Really, it was a basement studio in an academic building that broadcast to the cafeteria. That’s it. Just the cafeteria. We lobbied pretty hard for the university to add the signal to the closed circuit cable television system in the dorms, but during my three years at DePaul we were only on TV for a few months. This was all well before internet radio, of course, and now DePaul is streaming for all to listen. I haven’t bothered to find out if they’re actually in the dorms, or god forbid, on the air in Chicago now. Anyway, all I knew when I graduated from college was that I didn’t know what to do with my degree but that I wasn’t done learning, so I studied up for the GREs and then wound up moving to Philadelphia to get yet another degree, this time a masters in Communication. And during a summer internship, I got sucked into public radio, where I’ve been ever since. It wasn’t the news that drew me into radio. It was the way you could use radio to tell stories. I’ve never been a news junkie per se, but I’ve always been a sucker for a good story. And there’s something about talking to people about things that matter to them, and then helping tell those stories to a wider audience that’s addictive. I’ve filed literally thousands of news stories, on everything from regional politics to the impact of gambling on small towns. In every story, the thing that still excites me the most is that moment when someone tells me something, and I realize that they really mean it, and you can hear it in their voice. Commuting on the other hand, not so much fun. When my wife entered a graduate program in Princeton New Jersey I played the trooper, got up at 6am every morning and headed to Philadelphia for work. I usually didn’t get home until after 7 and then fell asleep shortly thereafter. About a year into this process I decided to try something new, so I quit my job at WHYY (where I still periodically file freelance news reports), set up a home office and began freelancing for National Public Radio, Public Radio International, and anybody else who would have me. Something I probably should have mentioned earlier is that I’ve always been a bit of a tech geek. 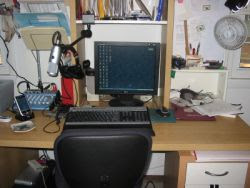 About the time I was setting up my home office, I applied for a position to write for PVR Wire, a blog about personal video recorders (like TiVo, or Windows Media Center Edition). I thought I could pick up a few bucks on the side blogging. Six months later, I consider myself as much a blogger as a public radio producer. PVR Wire has since been absorbed by TV Squad, another blog in the same family (Weblogs Inc, which is in turn owned by AOL). I continue to blog about personal video recorders, trends in online media, and digital video in general. I’ve also had the opportunity to begin writing a little bit of TV criticism, which is fun. My other main blogging gig is with Download Squad, a blog that’s generally about software, including things you can download or access on the web. Mostly I write about things you can do with a Windows Mobile personal digital assistants or cell phones. A few weeks ago, I began writing Mobile Minute, a regular weekly column on Windows Mobile tips, tricks, and software. And that about brings you up to date, at least with my professional life. Well, I did also spend some time manning the register at a book store in Chicago, selling wine, working in day care, juggling at kids parties, and teaching a course in radio journalism. Perhaps I’ll put those in order in another post. So what’s this blog going to be about? I haven’t entirely decided yet. I don’t want to duplicate what I’m writing for my other blogs, so for now I’m thinking this will be a blog about the blogger, although over time it may develop more of a purpose. In other words, I tend to collect a lot of information about news, politics, and technology during my days. It might be nice to use this blog as a mental dumping ground to sort my thoughts at the end of the day. Or something like that. Anyway, I hope you enjoy reading it. I promise not every post will be a walk down memory lane, but I needed a way to get things started.